NCPBUG is pleased to again offer PowerBuilder training as part of the conference. Conference activities will take place at the Center City Campus of the University of North Carolina – Charlotte and are subject to change or cancellation. The two "pre-conference" PowerBuilder training classes for the intermediate level will take place on Monday, May 4 (class one) and Tuesday May 5 (class two). Each track will be led by experienced "certified" PowerBuilder instructor Yakov Werde. The class registration fee is $300 and can be secured along with the conference registration. Make sure you select the appropriate training session at registration. All attendees will receive printed and pdf presentations, lab instructions, setups and exercise solutions. Each training class will be conducted on a single day. Each class lasts eight hours. All attendees must bring a notebook computer loaded with PowerBuilder 12.x (1, 5 or 6), SQL Anywhere 12 or later and the .NET 4.0 redistributable. Each topic has a least one and often several challenging stand-alone lab exercise(s) that are based on the common use-case lab application accompanying all eLearnIT PowerBuilder courses. Yakov Werde, MsEd is a veteran software developer with a passion for sharing his vast knowledge and experience with others.Yakov has been a certified Sybase Instructor and Developer since 1995 and is an avid enthusiast of Sybase/SAP technology. Yakov personally trained thousands of professional software developers on all aspects of enterprise application development using the PowerBuilder platform. 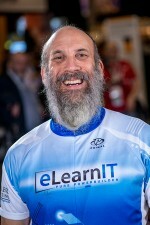 Now a 20 year PowerBuilder veteran, SAP Mentor, Sybase MVP, [TeamSybase] member, certified Sybase Instructor, PowerBuilder .NET and SAP HANA pioneer, Yakov is well known in the PowerBuilder developer community as both an informative and entertaining presenter and serious application developer.